The Augusto Roa Bastos Foundation seeks to recover and publicize the lesser known works of this Paraguayan writer, including his poetry, screenplays, speeches, prologues, news articles, essays, and children’s stories. People here are kind and eager to look after me. I travel by taxi to Agustín Barrios Street, because that’s where I am supposed to meet Mirta Roa, in the apartment where her father spent the last years of his life after living in exile for forty-eight years. Mirta comes down to open the door for me and I enter, intimidated by this place full of relics: this is the apartment of Augusto Roa Bastos (1917-2005), which the Foundation is preparing to open to the public if Congress declares it a cultural heritage site, like the homes of Neruda. Mirta is a delight and I feel comfortable with her. She tells me that the goal of the Roa Bastos Foundation is to recover and publicize her father’s work. His novels and stories are well-known but his poetry, screenplays, speeches, prologues, news articles, essays, and children’s stories aren’t as widely read. To remedy this, the Foundation is in the process of collecting dispersed material; Roa Bastos left texts everywhere his exile took him. He saved nothing and it’s also believed that some of his work was stolen. Roa Bastos’ daughter arranged the apartment so I could see it with the dining table full of books edited by the Foundation, and left the rest was as it was during the owner’s life. The desk is missing as are some of the paintings, including the Cervantes Prize, painted by Spanish poet Rafael Alberti; these items were taken to the Foundation’s offices, which have been housed in the pink-colored Augusto Roa Bastos Bicentennial House since last year. The Bicentennial House is the perfect location for the Foundation it is where Marshal Estigarribia lived. Roa Bastos admired Estigarribia for commanding the Paraguayan forces, which he joined during the Chaco War (1932-1935). The legs of the table in the Foundation were made by the artist and writer Carlos Colombino to represent elements from the book Yo el Supremo. Colombino was one of Roa Bastos’ closest friends and is now a member of the Foundation board. The most important painting in the apartment, which is also by Colombino, hangs over the sofa. Near the door, an old framed photograph draws catches my eye. It is of the Vy’a Raity group (“The nest of happiness,” in Guaraní), the young intellectuals of Asunción in the 1940s. They are in costume and in the center, looking majestic wearing the formal vestments of his uncle the bishop, is Augusto Roa Bastos. I’m surprised that this man, who could be described as small and fragile, “attached to a nose,” as Antonio Carmona, his friend and the current president of the Foundation once described him, could acquire this regal stature. They say he was low profile. He accepted awards and important meetings with resignation, but nevertheless, when he was with friends or in a small group, no one could resist him. He charmed with his humility and ease with words, his intelligence and wit, his indomitable sense of humor and an ability to make lively conversation which eludes some writers. Mirta Roa was the writer’s only daughter when he was forced into exile in 1947. The dictator sent troops after him at the offices of Asunción daily El País, where he was the editor in chief. Roa Bastos went on to write his greatest work in Buenos Aires; before exile he never really managed to transcend his small intellectual circle. Much has been lost from that time in Asunción. Although the story Lucha hasta el alba (Fight Until Dawn) has been recovered, there are no traces of Fulgencio Miranda, a novel that received the Ateneo prize, or his theatrical works, like La carcajada (The Laughter). In the Argentinean capital Roa won the prestigious Losada prize for his novel El trueno entre las hojas (Thunder among the Leaves). He also published Hijo de hombre (Son of Man, 1960), which gave him international exposure, and Yo el Supremo (I, the Supreme, 1974), considered his most important work and, according to many, the best and most complex of the Latin American novels about dictators. Mirta laughs, complicit, and comments, “Here all the ladies say they’ve read Yo el Supremo.” She sighs, still smiling and asserts, “This novel requires a lot of prior reading.” She also tells me her father would tell her that the novel has a trick that no one has discovered. At some point during the last years of the writer’s life, she asked him what the trick was, but he didn’t answer. Nora Bouvet, a professor from Rosario who specializes in Roa, may have revealed Roa Bastos’ secret in La estética del plagio y crítica política de la cultura en Yo el Supremo (The Esthetics of Plagiarism and Political Criticism of Culture in I, the Supreme): he transcribed whole chunks of Cervantes or whoever he felt like, rewriting, compiling and creating once again what had already been written. Two of Roa Bastos’ other children were born in Buenos Aires: Carlos, who is married to Ana Mascheroni, and Augusto, married to María Isabel Duarte. Mirta spent half her life in the city and remembers her father as a man who played affectionately with his children and also as an ogre who could not be disturbed with childish noises when he was writing. She remembers that the only decorations in the house were books, which were everywhere. She tells me funny anecdotes from her childhood, when being the daughter of someone who wrote stories and poems was a rarity. Augusto Roa Bastos wrote a book of children’s stories, which were published by La Florcita, the children’s imprint of Ediciones La Flor (publishers of Mafalda). This collection was edited by Amelia Nassi, who would become his companion for many years and his collaborator on countless transcriptions of famous novel. People say that Roa helped writers from the provinces that would not otherwise have had the opportunity to be considered “Argentinean writers.” He supported them with his prestige. These writers included his great friends Tomás Eloy Martínez, Juan José Saer, and Daniel Moyano, from Tucumán, Santa Fe, and La Rioja respectively. He was fascinated by the movies. He wrote dozens of screenplays, many of them in collaboration with Tomás Eloy Martínez. His first screenplay was Thunder among the Leaves, directed by Armando Bo and starring Isabel Sarli, who made her acting debut in the film. Paco Rabal, Olga Zubarry, and Lucas Demare starred in Hijo de hombre (also known as La sed [The Thirst] and Choferes del Chaco [Drivers of Chaco]). His fascination with movies inspired him to write Reflexiones sobre el guión cinematográfico (Reflections on the Screenplay), a work recently republished by the Roa Bastos Foundation. He also taught screenwriting at the Universities of La Plata and Rosario. Mirta recounts that he threw away all the screenplays he wrote that were never made into films. When the 1976 military coup in Argentina made his situation untenable, Roa Bastos was invited by the University of Toulouse to teach Latin American culture. He also taught Guaraní and fell in love with Iris Giménez, a professor of the Náhuatl language, with whom he had three more children: Francisco, Silvia, and Aliria. In France he continued to write, in addition to his university activities, but he never felt completely integrated. In contrast, he loved Madrid and adored Buenos Aires. He was living in Toulouse in 1989, the same year Stroessner was overthrown, when he received the most prestigious award of his career, the Cervantes Prize. From that time on, Roa traveled to Paraguay often and longed for a permanent return to his native land. This caused tension with Iris, until, finally, they separated and in 1996 he established himself in Asunción. He had lived in exile for forty-eight years and he was seventy-eight years old. The time following his return was intense and gratifying and he was filled with ideas and projects. He published Metaforismos (Metaphorisms), composed of sentences extracted from his novels, he wrote a column for the newspaper Noticias, and he dedicated himself to what Mirta called “his unwritten work,” contact with people, students, and conferences. In the documentary El Portón de los Sueños (The Door to Dreams) by Hugo Gamarra, he returned to Iturbe, the town of his childhood. The International Film Festival, which is celebrated in September, was inspired by Roa Bastos’ desire to have a film institute in his country. At the festival, Hugo Gamarra, director of the Cinematic Foundation of Paraguay and the Roa Bastos Foundation, gave talks on Roa as a filmmaker and convened the first Roa Cinero National Screenplay Contest. Roa Bastos’ other projects included making illustrated editions of stories in installments, with large letters, accessible to the entire public to promote literacy and reading. This project was realized after his death. Mirta´s look clouds over when she talks about the domestic helper her father had for a long time. The woman gained the writer’s confidence, but then neglected him and kept him isolated and drugged. She also stole a lot of money. Mirta and her brother Carlos had to travel from Caracas, where they lived, to put a stop to it. Luckily, once he stopped taking tranquilizers, Roa Bastos completely recovered his lucidity. A moment passes, and Mirta smiles as she looks at the Guaraní language children’s books she is holding. 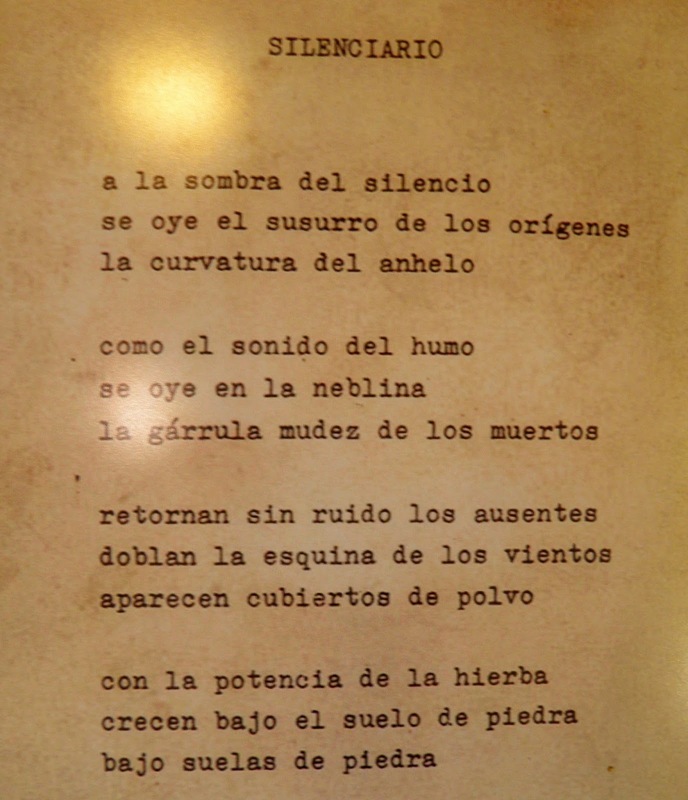 One is called El Pollito de Fuego (Ryguasu’i Tata), which Roa Bastos wrote when Natalia, his oldest grandchild, was born. This book is now part of the project, “Pueblos originarios, Roa Bastos y multilinguismo,” (Original Peoples, Roa Bastos and Multilingualism), financed by the Spanish Agency for International Development Cooperation. This project is also responsible for reprinting Las culturas condenadas (The Condemned Cultures), a selection of essays on the indigenous communities of Paraguay, compiled and introduced by Roa Bastos, with a prologue by the former Minister of Culture Ticio Escobar. Mirta told me that this year, for the anniversary of Roa Bastos’ death, literature students from the Humanities Department organized a day of readings and other events. She considers it essential to pass his legacy on to young people and she couldn’t be happier that they organized this event on their own. —“They asked my permission to publish the prologue Roa wrote for La lombriz (The Earthworm) by Argentinean writer Daniel Moyano,” Mirta says, laughing. “I gave it to them, but I had to ask them to please send me the prologue; I didn’t have it. These are important findings for the Foundation’s archives. The prologues are incredible,” she adds. “The one for Tentación de la utopía (The Temptation of Utopia), by Rubén Bareiro Saguier and Jean-Paul Duviols, is particularly impressive". Although the Foundation was established in 2007, it wasn’t until after 2011 that it became permanent, with support from the Spanish Agency for Cooperation. Mirta, her brother Carlos, and Toni Carmona have visited cities in the interior of Paraguay, as well as Resistencia, Corrientes, and Formosa, in Argentina as representatives of the Foundation. They will be in Uruguay in October for the Book Fair. They promote these “new” old books and continue their work to recover others. Mirta tells me they just recovered a drum that her father had next to a caja chayera (double-headed frame drum) and a harmonica. Roa Bastos loved music and wrote many lyrics, set to music by Agustín Barboza and others. Many times he scored them himself. When he left for his second exile, the drum remained in Buenos Aires, in the house of Amelia Nassi’s mother. We finish the interview and she gives me the address of the Roa Bastos Foundation. The next morning I walk through rose-colored Asunción towards Marshal Estigarribia’s old, pink house. In the plaza there is a fabulous bookstore, Servilibro, which is home to a publishing company dedicated to Paraguayan authors. I go inside looking for a book on Paraguay’s indigenous art that an artisan told me about. It was written by Ticio Escobar, one of Roa’s friends and a member of the Foundation’s board, as well as the former Minister of Culture. It’s so hot today that the saleswoman offers me a refreshing tereré and I regain my energy. I buy the book and go inside the house and take a look around the museum, the screening room, and the patio. Then Toni Carmona arrives to continue talking about Roa Bastos. As we ramble on, I start thinking of my return and because the two of us like to talk, we discuss Latin American cinema, the Cinemateca, and the next Film Festival of Asunción, sitting at a patio table, with coffee and very cold water. We also talk about Rafael Barrett, who I happen to be reading, and the fact that Toni is in the middle of research that will frequently take him to Uruguay. While we are talking, Mirta calls him to tell him to give me a copy of Yo el Supremo, because I told her I had read it when I was nineteen but never again. We go to Servilibro and I wonder how I’m going to pack so many books into my luggage, because yesterday Mirta gave me quite a few. And then I feel that Asunción is not only rosecolored, warm, and welcoming, but it is also home to many people who are so concerned about culture that they are able to make amazing things happen. And from this “island surrounded by land,” as Roa described Paraguay, they are weaving cultural ties with neighboring countries, ties that go beyond political accords and are more solid and lasting. To contact the Roa Bastos Foundation, write to fundacion.arb@gmail.com.